Some would say that Bluetooth speakers are not fashionable anymore and that they don’t have such usefulness anymore. Well, they are wrong. These devices that use advanced audio technologies and that can be carried around so easily are highly practical, fun and pleasant to use. Although the market is filled with complex audio systems that offer one the ultimate sound experience, Bluetooth speakers offer freedom of movement and flexibility, as well as high-quality sound. These smart speakers can be used anywhere, as long as you can connect them with your smartphone, tablet or laptop using Bluetooth. They can be charged using a USB cable and last for a long time between charges. Most such devices can be controlled up to 100 feet away, so you can enjoy the sounds that you most enjoy even from a distance. The latest Bluetooth speaker models have gorgeous designs and intuitive controls, so they are easy and comfortable to use. Depending on your needs and budget, you can even find speakers that are waterproof, shock resistant or that use pretty advanced sound technology, such as JBL. In order to make your life easier and help you decide faster, we have selected the best portable Bluetooth speakers on the market. We have analyzed their pros and cons and highlighted their most important specs. Check them out below and decide which one is best for your needs. If you imagined that all Bluetooth speakers are small and lightweight, you will be surprised to know that there are portable speakers on the market that are large-sized and that come with a lot of specs that you will simply love. This product measures 9.2 x 12.5 x 13 inches, weighs approximately 17 pounds and it is not your average Bluetooth speaker. The ION Audio Tailgater is awesome for a number of reasons. It has a cool design that integrates perfectly in any leisure environment, a battery that lasts up to 50 hours of continuous use, a great speaker system and Bluetooth connectivity. More than that, it can be controlled from an app that is available for both iOS and Android. Besides being a Bluetooth speaker that sounds great, it can also be used as a power bank to charge smartphones and tablets. This device includes a microphone, so it can be used for fun events such as karaoke. Also, it has AM/FM radio, a large display and a 1/8” auxiliary input. It might not be the most comfortable speaker to carry around, but it is definitely what you need when outdoors. It dynamic power of 50 watts is ideal for open spaces, so if you like to go out in nature a lot, you might want to take this product with you. Unlike other similar Bluetooth speakers, this product can be paired with your smartphone using NFC technology, with a single tap. Are you looking for a Bluetooth speaker that has great sound capabilities, but is also highly portable and has a gorgeous design? Then this model from Ultimate Ears might drag your attention. This Core Lineup style speaker comes in eight color options that you can choose from. It has a stylish design that allows it to offer its users a 360 degree sound experience and the ability to control it using an app. This product was designed for adventurers, so it can be used for rooftop parties, in nature and practically everywhere. It is waterproof, and shockproof and it durable enough to last for years. It can be connected to any smartphone or device that has Bluetooth connectivity and that is capable of playing music. From a technical perspective, it isn’t as advanced as the first product in our list, yet it is still a good choice for the money. It has a 15-hour battery life and it can be controlled from a 100 feet distance. Also, it has a rechargeable battery with a limited number of charge cycles. It allows up to 150 earphones connections wirelessly at the same time. It can be used right from the box. No installation is needed, but you have to make sure that its battery is charged. In order to start using it, you simply have to press play, pause or skip, depending on your needs. Are you a music enthusiast who wants to turn every outdoor event in a party? You like your portable speakers to be high-quality and capable of producing the right effects? Then you will love this device. 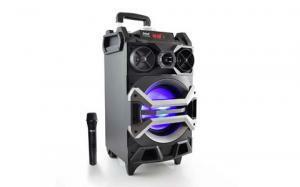 This Pyle model is large-sized, yet portable, comes with a practical handle, flashing DJ lights and a 500 watt, 8-inch subwoofer. Also, it has dual 3-inch tweeters for full range stereo sound reproduction. It includes an audio connection cable and a remote control that helps you skip songs, play, pause, stop and more. Whenever you want to play music from your phone, tablet or laptop, you can connect with the speaker using the Bluetooth function. With this device, you have everything you need to have some fun. Besides having this built-in light system, it also includes a wireless microphone, so you can organize karaoke events for your friends and family. Its rechargeable battery lasts more than the average Bluetooth speakers’. Also, you might be impressed with its bass. As for its streaming capabilities, it can play from a USB or SD card via Bluetooth. There’s more to it: it has a recording function that only makes it better. In case you want to stop using it wirelessly or you notice that its battery is low, you can also use its wall power adapter. 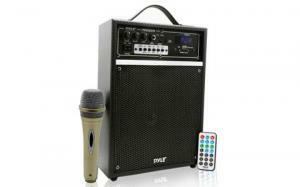 Pyle has a rich speaker offer and has adapted to its consumers’ needs quite nicely. It brings to the market yet another portable Bluetooth speaker that is versatile and convenient for outdoor events. By comparison to other similar models, this one is very inexpensive, yet it has a lot of great specs. 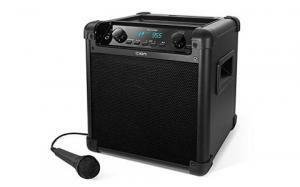 It is a 300 Watt device that can play music via Bluetooth using a 6.5 inches subwoofer. It integrates Pyle’s pro features for wireless audio streaming and is compatible with smartphones, tablets and computers that can connect through Bluetooth. The great thing about this product is that it has a vintage design, a control panel that will remind you of the disco times and a karaoke system that includes a microphone with a 10 feet cable. This product supports the usage of USB and SD cards, which is awesome. You cannot only play online music from your phone, but also mp3 audio files that you have stored on your external memory devices. It features a heavy duty battery that lasts for 8 hours when fully charged. When discharged, you can still use it thanks to its power adapter cable. Are you ready to invest in a professional, high-quality speaker that is large and powerful, yet highly portable? Although this product is pricier than the others in our list, it is totally worth the investment. The Underground 15 model has a rechargeable battery, a 15-inch woofer, a class D amplifier and Bluetooth connectivity that allows you to listen to music wirelessly and get rid of all the cables. This portable speaker can read audio files from USB and SD cards, it is equipped with a physical stereo input, as well as a wireless microphone. The great thing about it is that it has a guitar input, so you will be able to organize real music events that will inspire. 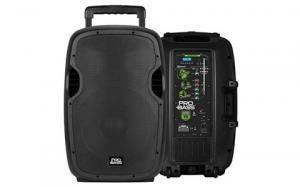 If you are into music events and you would like to be able to offer your friends and family the best sound experience, this 1600 watts speaker is exactly what you need. It is easy to use and control, thanks to its LCD display and intuitive controls. More than that, it comes with a remote control that eliminates the need of staying next to it and allows you to have fun at the same time. Configuring this device right after unboxing it is easy, as you simply have to turn it on and connect it with your phone. Another advantage of this product is that it can be used to make announcements, thanks to its priority mode that decreases the volume of the music while speaking on the mic. If the quality of the sound is important for you and you cannot settle for just any speaker or sound system, then you will surely find it important for your Bluetooth speaker to have a wide frequency range, great drivers and enhanced features such as app support, the ability to pair multiple speakers, the ability to connect to a virtual assistant and many more. If you are a music enthusiast and you would like to be able to listen to music in any random place, like a picnic, a campfire, in the countryside or when taking a long bath, then you will appreciate a speaker with a good battery. The market has endless options when it comes to audio devices that you can use wirelessly. The question that you should ask yourself is whether you need specific features that automatically imply a higher price or if you are satisfied with the most basic functions. That should be the starting point. From that point onwards, you can decide which device is better for your needs depending on your personal preferences and your desire to invest in such a product.